Post-retirement aches and pains can’t prevent sixty-five-year-old Lilly Jayne from keeping the most manicured garden in Goosebush, Massachusetts. But as a murder mystery blooms in the sleepy New England town, can a green thumb weed out a killer? With hundreds flocking to her inaugural garden party, meticulous Lilly Jayne hasn’t left a single petal out of place. But the picture-perfect gathering turns unruly upon the arrival of Merilee Frank, Lily’s ex-husband’s catty third wife. Merilee lives for trouble, so no one is surprised after she drinks too much, shoves a guest into the koi pond, and gets escorted off the property. The real surprise comes days later—when Merilee is found dead in a pile of mulch . 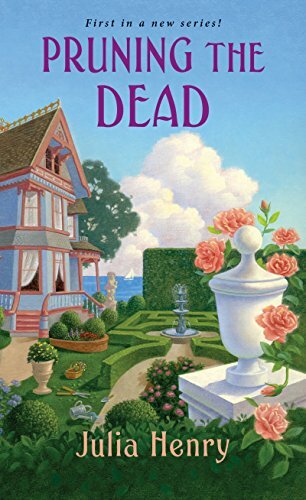 . .
Lilly wishes she could stick to pruning roses and forget about Merilee’s murder—until her best friend and ex become suspects in an overgrown homicide case. Now, aided by the Garden Squad, an unlikely group of amateur crime solvers with a knack for planting, Lilly knows she has limited time to identify the true culprit and restore order to Goosebush. Because if the murderer’s plot isn’t nipped in the bud, another victim could be pushing up daisies! Lilly Jayne has been grieving for her husband, but is finally ready to rejoin life in her small town of Goosebush, Massachusetts. With the help of her friends Tamara O’Connor and Delia Greenway, she hosts a garden party showcasing her beautiful plants and landscaping. At the party and at another event that evening, Lilly keeps crossing paths with her ex-husband Pete Frank and his obnoxious wife Merilee. Lilly tries to put Merilee out of her mind, but then a few days later, Merilee is murdered. The local police chief is over his head and latches on to the easiest suspect – Pete. Lilly believes in Pete’s innocence and gets her friends to help with her own investigation to find the real killer. I love the premise of this book. A retired woman and her diverse circle of friends are sleuthing by day and doing good deeds to beautify the town by night to avoid the scrutiny of a by-the-book town employee. Lilly has lived in Goosebush her whole life so with her contacts and her young friend Delia’s research skills, together they are able to find a much larger list of possible suspects than their inexperienced chief of police. In fact, they find so many people with a motive to kill Merilee, they enlist the help of some of their other friends to double-check timelines and verify alibis. Although some of the dialogue is a little stilted, the best parts of the book are these scenes with Lilly and her friends. Lilly hasn’t had much of a social life recently, but her friends are helping her to get back to being her blunt, but kind-hearted self and it’s great to see how the friends support each other. I love how the garden squad pitches in to help their friends and make their community a better place. Unfortunately, it takes a while for the pace of this book to pick up. During the first several chapters, the reader is weighed down with facts about the history of the town and its residents. Many of the characters have complicated ties to each other and I experienced information overload with too little action for much of the beginning of the book. Things pick up after the murder, but even with all of the suspects, there is one character who is so unlikable that you knew you were looking at either the killer or a future victim. The plot was a letdown, but I did come to care about the main characters. Although the book is flawed, reading about Lilly and her various friendships is enjoyable. I think this new series has potential as long as future books include less telling and more action. For anyone who loves to garden, there are many details about gardening throughout the story and at the end of the book.